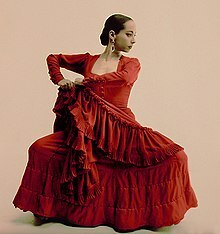 ↑ See the 3rd definition of the term flamenco in the Dictionary of Real Academia Española. ↑ (1990) Flamenco: Gypsy Dance and Music from Andalusia, trans. Molly Comerford Peters, Portland, OR: Amadeus Press. This page was last edited on २६ डिसेम्बर २०१४, at १२:०९.